The science, which teaches arts and handicrafts is merely science for the gaining of a living; But the science which teaches deliverance from worldly existence, is not that the true science? Even three times a day to offer three hundred cooking pots of food does not match a portion of the merit in one instant of love. 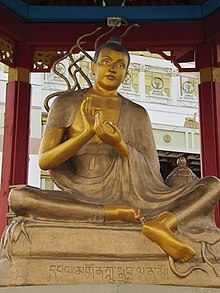 Nāgārjuna (c. 150 – 250), called the "second Buddha", was an Indian Buddhist priest and thinker. He systematized Mahayana Buddhist philosophy around the central concept of the emptiness (shunyata) of all existents (dharmas). Who have no wisdom, neither discipline, you need not bow. Though lacking other virtues, you should revere. In one instant of love. You will not exhaust all your foes. your real enemy will be slain." Nagarjuna & Sakya Pandita. (1977). Elegant sayings. Cazadero, California: Dharma Publishing.